Jan Berendsen has been successfully coaching women's volleyball for decades. Over the years he has won 13 titles divided between National Championships, Cups and Super Cups. 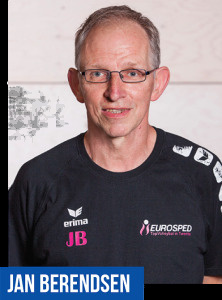 Currently Jan Berendsen is head coach of Eurosped TVT Almelo, in The Netherlands. To what extent does Volley-Train help you and your staff while working with Eurosped TVT women's team at the moment? In what way do the players come into contact with Volley-Train? The players give input on their wellbeing privately every single day; the part where they comment on their state in their own words is very helpful. Volley-Train is also used to share information online about the next opponent. On match day the game plan is discussed briefly but the actual information is already known. Match data is accessible for the players 10 minutes after the match is played. It answers the question 'How did I do?' quite nicely! Players can review and evaluate test data and manage their personal targets. They can learn how to help other team members during matches and practice sessions. It creates more insight and understanding among the team. Is in your opinion the usage of Volley-Train restricted to the top level teams or can every coach take advantage of the system? For sure it's usable on every level. The fact that you can have all your drills and practise sessions online and being able to review and rewrite them instantly is very convenient. Do you think the current Volley-Train version is sufficient or are there more items on your wish list? Chris Timm and his team are working constantly at further development which is of course a big advantage. All the items on our wish list like online streaming of analysed match videos or form upload were implemented recently. Currently we are looking into the possibilities to implement heart rate and vertical jump data. Heart rate, number of jumps and total practise time should add up to assign a certain load to a session. The psychological component will need further attention also. What types of player do I work with, what kind of team am I dealing with? How does player X move: from her back or her belly? If you can remember all these things you are very good but that is something not given to us all by nature. Things will be more easy if you have instant access to the facts. What will be the future for digital and technical devices for coaches in volleyball? It will be under constant development; if you don't want to follow this digital path as a learning coach then it's maybe better to quit in my opinion. I think further integration of systems like Volley-Train will be necessary to keep the growing stream of data quick and clearly accessible. Integration of Volley-Train is currently focussed around training but it will evolve more towards the matches also. A platform where devices like Polar heartbeart, VERT jumping, Data Volley analysis, injury and revalidation management, power or, as we like to call it, speed training programs will be connected. This also applies to relevant psychological data. What is the best way to teach player X or how can I deal with player Y in a stressful situation? Again, you can't remember everything but by structured storage you can find it quickly and put it into practice. Volley-Train will soon be the platform where everything concerning your team comes together, and where you store scouting data on future prospects and players. Within private Volleyball Schools or the Regional Talent Centres where coaches work with a lot of different players it might be a relief to have Volley-Train at their disposal. Before a practice session you can review the prepared practice and walk through the points of attention for each player individually. It's not unthinkable that using Volley-Train will help to build the image of organisations which use the system. The fact that they are users of the system will make their work both more personal and effective.